Party rentals such as pipe and drape, staging or stanchions can be necessary for finishing off your event production project. 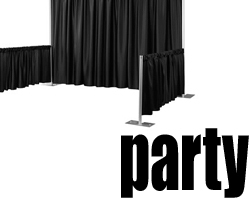 At FP Logistics, you'll find a wide variety of party rental equipment for all your production needs! Pipe & Drape: Whether your covering a wall, partitioning a dressing area, or transforming an entire room, pipe and drape is an excellent and cost effective solution. You'll find a wide selection of pipe and drape from FP Logistics! Special FX: There are certain special effects that can only be created with specialized equipment. At FP Logistics, you'll find a wide variety of special effects equipment for all your production needs! Chauvet Warm White LED Pars available for rent! Roland V-1200HD Switchers available for rent!